Have you ever considered a log boiler for home heating? Brian Dillon and his family had both environmental and economic reasons for considering a log boiler for home heating. The cost of heating their two story house with oil was high and rising. Also, they wanted to move to a local fuel source, reducing their dependence on fossil fuels. They had already upgraded the insulation, windows and doors of their home to make it as energy efficient as possible. Complementary Solar Thermal panels on the roof provide hot water during the boiler’s off season. 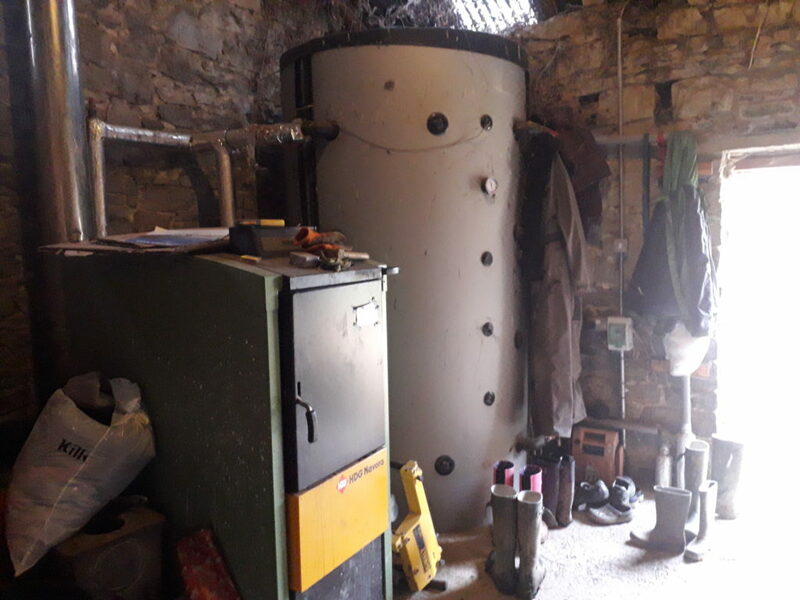 Glas Energy installed a HDG Navora log boiler and a 2000L buffer tank into an outhouse a stone’s throw from the dwelling house. From September to early May the boiler is typically lit every 3 days but this increases to every second day in cold weather. The logs are loaded into the fuel chamber on a base of kindling and cardboard. The wood is burned at a high temperature in a process of gasification leaving only small amounts of charcoal in the burning chamber. A thin layer of ash is collected in a bottom tray. Brian recommends leaving most of the charcoal in place as it assists in the ignition of the next load. The ash tray is emptied onto the compost heap every couple of months. A light inside the house lets the occupants know when the water in the accumulator tank falls below 40°. Below this, the radiators are luke warm and the boiler is relit, taking 4 to 6 hours to reheat the water in the tank. Reloading and lighting takes less than 10 minutes. When the log delivery arrives we all chip in to stack them inside the shed – it can take a whole day. Of course there is more work to this than ordering a tank of oil and flicking a switch. But there is something very satisfying about it too. And we are definitely saving money over buying oil. If you have the space and a reliable local fuel supplier I would recommend it. Brian has tried different sources of logs since 2012 and believes that there has been a marked improvement in availability. “For a long time Ireland lagged behind the rest of Europe on the production, drying and grading of quality wood fuel” he says. “I’m glad to say that this is changing. Our fuel now comes from Coillte managed forestry and is dried and prepared by Gabbett’s in Callan. 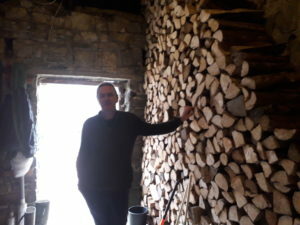 The moisture content is critical to the energy value of the logs and these are 20% which is just right.” In late summer, the family receive a delivery of half metre logs amounting to 40m3. A few years ago the family planted birch, ash and other hardwoods on their 5 acre small holding. Initially their motivation was to grow some of their own fuel. This is no longer a priority and as they are happy with the local source of fuel for their log boiler for home heating. There own trees have earned a reprieve.